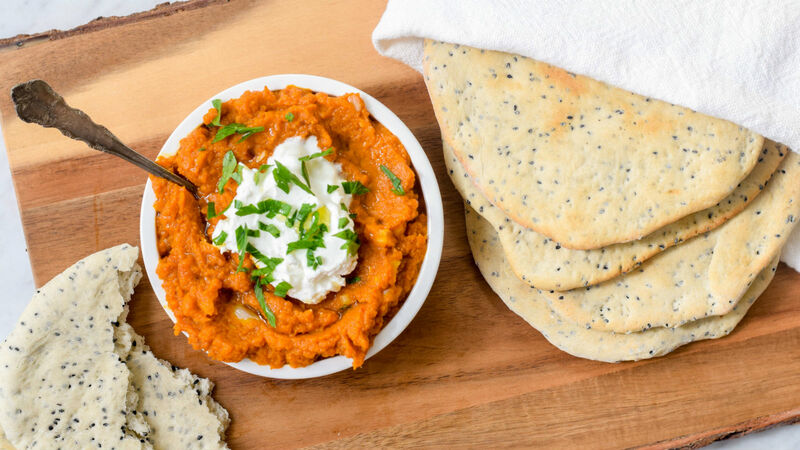 Forget the pumpkin spice lattes — try this tangy, savory pumpkin recipe this fall. October is upon us. I know because my Instagram feed is full of decorative gourds and pumpkin spice lattes. But, as much as Americans truly love pumpkin, we are sometimes guilty of type-casting this nutritious vegetable as sweet and forget that pumpkin has a savory side too. Happily, Sephardic cuisine abounds with savory pumpkin dishes to remind us of this fall vegetable’s versatility. My favorite of these is chershi kara’a, a tangy, spicy pumpkin spread created by Libyan Jews and now a favorite among Israelis. Chershi (sometimes spelled chirshi or tershi) are spicy, highly flavored condiments or dips that are typically served as part of mezze, the spread of hot and cold dishes that precede the main meal in the Middle East and North Africa. Pumpkin chershi is among the most famous. I first learned about pumpkin chershi when I attended an event hosted by the Israeli consulate in Chicago. The event featured leading Israeli food personality Gil Hovav making some traditional Sephardic dishes from his childhood, one of which was pumpkin chershi. One taste of Gil’s savory, spicy chershi and I was hooked. As is often the case in Jewish cuisine, there are many ways to make pumpkin chershi. In his dish, for example, Gil Hovav mixes pumpkin with carrot and potato. Others use only pumpkin. But everyone seems to agree that chershi kara’a should be spicy and tangy, with lots of garlic and lemon juice. My goal with this pumpkin chershi recipe was to create a nice balance of sweetness, heat, and acid. I guarantee that it will change how you think about pumpkin. How best to eat it? Chershi makes a fantastic dip alongside some warm pita with a dollop of cool yogurt on top. But don’t stop there. Chershi also works as a sandwich spread and it has traditionally been eaten as a garnish for couscous. So, this fall, take a break from pumpkin bread and pumpkin spice lattes and make something new and especially Jewish with pumpkin. Note: The spread will keep in refrigerator for a week. Heat 2 Tbsp of the olive oil in a medium saucepan over medium heat. Add the garlic, cumin, paprika, and red pepper flakes. Season with salt and stir to combine. Cook just until garlic begins to turn golden. Add pumpkin, harissa, and honey and stir to combine. Cook gently, just until pumpkin is warmed through. Remove from heat and stir in lemon juice. Taste and adjust seasoning. Dip should be tangy and spicy. Serve with Greek yogurt and warmed pita or as a garnish for couscous. 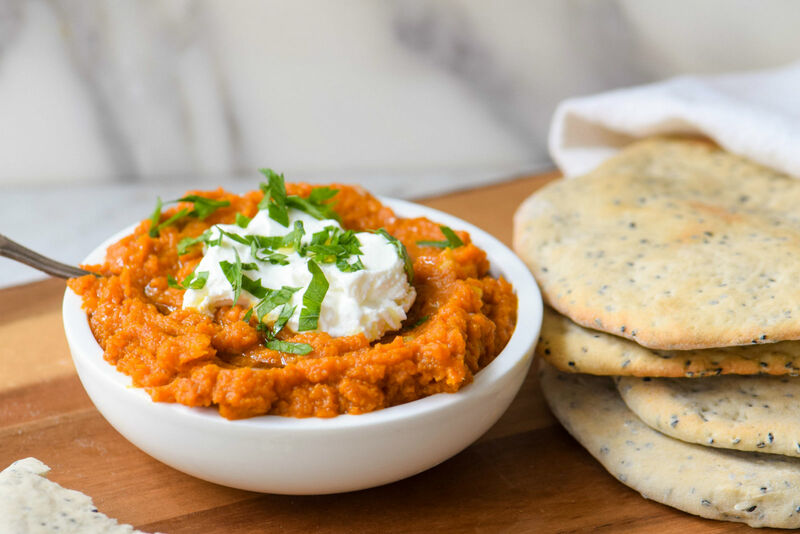 We love hummus, and we love pumpkin so we decided to marry these two loves in an easy, seasonal dip.